After spending years making cold process bar soap, I ventured into the world of making liquid soaps and shampoos from scratch. I have been making cold process handcrafted soaps for several years now and was ready to venture into the world of liquid soapmaking. 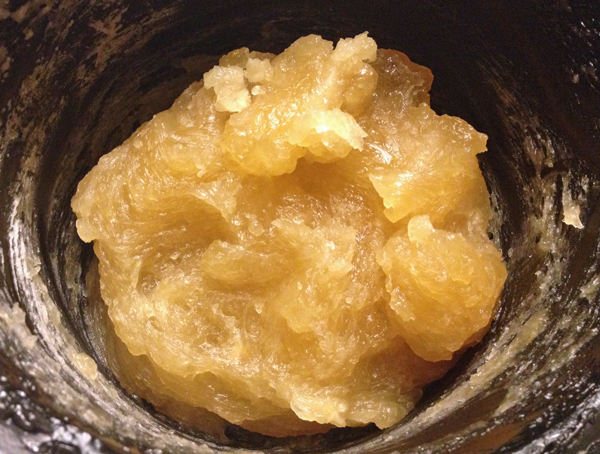 I make several versions of cold process shampoo bars, but many of my customers prefer shampoo in liquid form. Liquid soaps can also be preferable for guest bathrooms where bar soap can be a bit messy. They are also wonderful in foamer bottles. There are very few books and resources available to those looking to learn the process of liquid soapmaking and it takes lots of patience, practice and note taking to make it successfully and consistently. I am not going to get into the various base oils and their properties and what they can bring to your soap recipe as there is a ton of information available regarding that. My goal here is to show and explain how I make liquid soap and shampoo and hopefully help someone else struggling with the process. Liquid soap is a bit more challenging than cold process soap, so if you have never made handcrafted soap of any kind (not including melt and pour), you may want to start with a simple 3-oil cold process soap first. This will give you an idea of what trace is, what the initial saponification process is what can and cannot go wrong. So let's get started. I am not posting a specific recipe here since the point is the process. The recipe I am using for this is a shampoo so is high in hard oils (Coconut, Babassu) and low in soft oils (olive oil, castor oil, almond oil) so it will trace a bit quicker. The more soft oils in a recipe, the longer the process takes to get to trace to start the cooking. 100% soft oil formulations will take the longest to come trace and to get to the cooking stage. Please remember, there are many soap formulations and processes out there, but this is how I make my liquid soap and shampoo. Please use all safety precautions including wearing eye and hand protection, long sleeves, long pants and closed toed shoes. Both Sodium Hydroxide and Potassium Hydroxide are caustic materials which will burn if they come into contact with your skin or eyes and can do some serious damage. Not something to scare you away, but always take appropriate safety measures when making soap from scratch. My 4.5 quart crock pot does a great job on formulations with 20 - 25 ounces of oils, over that I move up to the 5 quart then the 6 quart for even larger batches. You do not want your soap to overflow the pot. Step 1: Calculate your water and potassium hydroxide amounts. I use Summerbee Meadow's Advanced Calculator or Brambleberry's Lye Calculator for liquid soap with a 0% to 2% superfat. Both calculators are calibrated with a small lye excess that should create a soap that does not need neutralization. Previous methods used a lye excess to insure a clear soap that was then neutralized to remove the excess lye due to impurities in KOH. These calculators now take those impurities into consideration to more accurately calculate your lye amounts so neutralization should net be necessary. Be careful with your superfat numbers as excess fats that cannot be saponified may cloud your soap. Once you get a handle on liquid soapmaking you can also try making dual lye soaps combining both potassium and sodium hydroxides. By using two lyes, you can get a soap with more "body" and in some formulations you will get a thicker diluted soap - results will vary. I have made liquid soaps with 10/90 up to 40/60 ratios of sodium/potassium hydroxides. You can use the summerbeemeadow calculator to determine lye amounts for 2 lye soaps. *** Note that both Summerbeemeadow and Brambleberry calculators take into account the 90% purity of KOH and are calibrated with a very small lye excess so you are not formulating with a large lye excess that must be neutralized after dilution. The actual purity the calculators are calibrated for is about 94/95%. 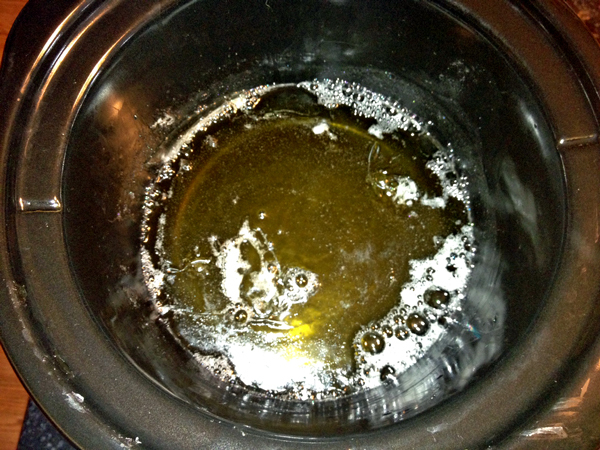 Step 2: Measure out your oils into the crock pot and melt them on high. Bring oils to a temperature of about 160 degrees F.
Step 3: Measure out the distilled water into the pyrex measuring cup and potassium hydroxide KOH into another container. Slowly add the potassium hydroxide to the distilled water while mixing with a whisk until it is all dissolved. This mixture will heat up rapidly so go slow, adding small amounts at a time. Never add the water to the lye. As you know, lye is very caustic and you do not want to get it on yourself or breath it in. Step 4: When oils have reached a temp of about 160 degrees F and water/lye about 140 degrees F (these are not set in stone, just what I strive for. I have made liquid soap with either of these being +/- 10 degrees), slowly add the lye mixture to the melted oils in crock pot using the stick blender to blend. Step 5: Continue blending until the mixture starts to thicken up. Formulas high in hard oils (coconut, babassu) will reach thicken up quicker than those higher in soft oils. The blending will product bubbles on the surface. 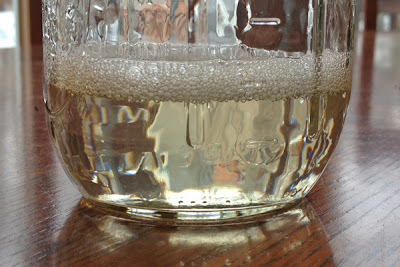 The bubbles start out tiny, but will increase in size as you mix and the mixture starts to thicken. It is a sign I look for that indicates the thickening is taking place. Step 6: Continue blending with the stick blender or by hand (sometimes the motor of the stick blenders need to rest or they can overheat and you can switch back and forth between hand mixing and stick blending - but keep the mixture moving). The mixture will start to hold its shape like pudding (and wiggle a bit too). The bubbles tend to start getting larger as they try to get to the surface which is a sign that the mixture is thickening. The mixture will also get lighter in color. Once the mixture can hold its shape like thick pudding, you have achieved trace. Some formulations move so fast once they start to thicken that you could miss this - not a big deal. Step 7: Before you know it the mixture will immediately get so thick that the stick blender will not function in it. Remove the stick blender and mix with the mixing utensil - a large spoon or sturdy spatula. You want this to be sturdy as this mixture will be very difficult to stir and you don't want to snap the utensil. 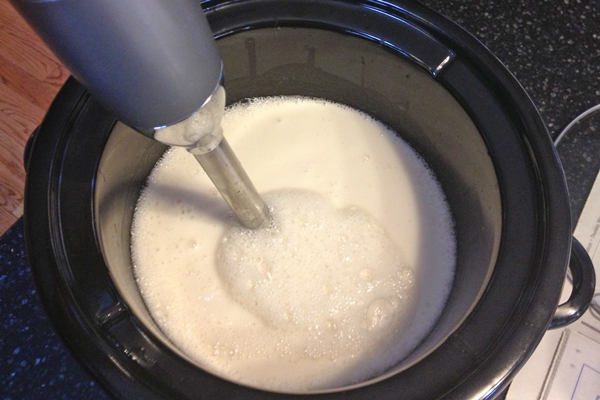 I personally remove the stick blender and mix by hand when the soap shows signs of thickening (thick pudding). This phase can happen so fast that I have actually broken the blade on my stick blender trying to get the soap paste off of it. Formulas with a high amount of soft oils (especially 100% olive oil) may never get to this stage and you will find it difficult to keep the lye mixture and oils blended. If you stop mixing, you will notice them try to separate with little pockets of oil on top, but just keep mixing and soon, it will all stay blended together. Step 8: As you continue mixing and turning the mixture, it will continue to thicken until it is very stiff and difficult to mix. 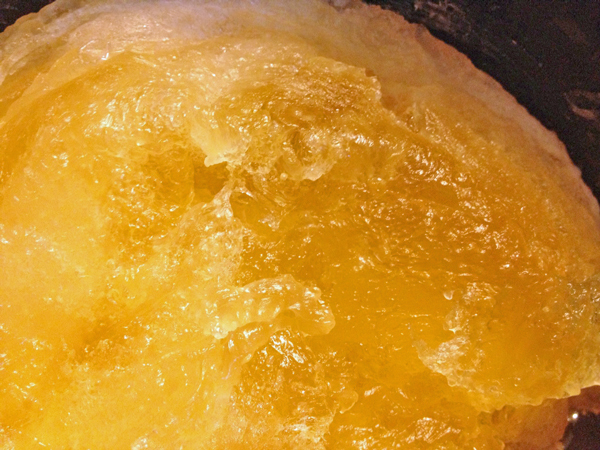 This is often referred to as the "Taffy" stage as the mixture resembles taffy. Again, 100% olive may not get to this stage. Step 9: Once you get to this stage it is time to cook the paste. I keep my crock pot on high and the paste cooks at a temp of between 170 - 200 degrees F. Cover, the crock pot and set the timer for 5 - 10 minutes. We need to check that all the lye mixture has been fully incorporated into the oils. After this time, check the mixture for liquid at the bottom of the pot. If there is watery liquid (not the condensation that drips back in from the lid), then mix it again and repeat the 5 - 10 minute cycle until no liquid is at the bottom of the pot. The picture below shows no liquid at the bottom and is good to go. Getting to this point can take anywhere from 20 minutes to hours depending on your formulation. Step 10: Put the lid on the crock pot and write down the time. This is when you start your cook. You will be checking and turning your mixture every 30 minutes until it has cooked for 3 hours. Your mixture or paste will slowly become more translucent during this initial 3 hours. You should start seeing spots of translucent paste after the 1st hour. Turn and mix the paste at these 30 minute intervals. The paste may be very stiff and you will have to break it up a bit to keep it mixed. After 3 hours it should be very translucent and the color will become darker. The color will depend on the oils used. The lighter the oils (coconut) the lighter the paste, the darker the oils (Extra Virgin Olive Oil or some infused Oils) will create a darker paste. Step 11: At this point you can test the paste for clarity but diluting a small bit in some distilled water. This is also when I will test will the Phenolphthalein. This is the only way to know for sure that all the lye has been used up. Your soap can test clear, but the paste can still turn pink indicating excess lye and a high Ph. To test for clarity, boil about 3 ounces of distilled water and add a dollop of soap paste and mix it up breaking up the paste. Once the paste has diluted, you can check the clarity. If your soap is milky or very cloudy/hazy, keep cooking it and recheck every 30 minutes - 1 hour. Some oils and butters will not create a clear liquid soap because of unsaponifiables or if you superfat your formula too much. These can include shea butter, avocado oil and jojoba oil. Used in small amounts, you should still get a clear soap, but too heavy in these oils, butters and the unsaponified fats will cloud the soap or fall to the bottom. If you superfat too much, you may also have difficulty getting a clear soap. My diluted sample at this point will typically test 9.7 - 10.2 on a digital pH meter at room temperature. Please note that there are many variables that will affect your pH readings giving false readings. These include the temperature of your sample and the concentration. To get the most accurate reading, dilute a 1% sample of your paste into 99% distilled water and take a reading with that sample. If you don't have a digital pH meter, I would highly recommend one that is easy to calibrate. You can get a good one for about $55 or so. This is the one I use: Oakton Digital pH Meter. I paid about $65 for it AND the calibration solution on Amazon. It is important to easily calibrate a digital pH meter and I do so prior to each batch of liquid soap I make. Two other good and reliable meters are the Extech Meters and the Milwaukee Instruments MW100. Please note that I have linked to Amazon listings, but prices/shipping will very and you should shop around for the best price. At this point, many will be done and will neutralize the excess lye if it exists with a solution of citric acid, boric acid or borax. I prefer to continue cooking the paste until my paste no longer turns pink from the phenolphthalein drops. I like my soaps to have a pH of around 9.2 - 10 - which is normal for liquid soaps. My pastes will typically cook from 3 - 8 hours and will depend on the oils, batch size and temperature. To test for doneness (no excess lye) with the Phenolphthalein drops, dab a very small amount of paste onto a white paper towel or other white surface and place a drop or two of the Phenolphthalein solution onto the paste. It will either stay clear or turn a shade of pink from dark to very, very pale. The darker the pink, the more lye is present in the soap paste thus making it more basic. As it gets closer to testing clear with the Phenolphthalein drops, the paste usually softens up to the consistency of chunky vaseline. Once the texture of the paste is very soft and smooth, the Phenolphthalein will usually test clear or just have very faint ring of light pink around the edges. Please note that the consistency of your paste will vary based on your oils used. Some pastes seem rock hard and difficult to mix, others are very fluid as they cook. Some are fluid during the cook, but harden up as they cool. Test a paste sample after every hour of cooking. Phenolphthalein drops used this way will test for excess lye only - not determine the pH of your soap. Your soap can test clear with drops and still have a high pH that should be lowered (above 10). You can also use a titration method to determine excess lye too. Please note: Phenolphthalein drops are a pH indicator to determine if and/or how basic your solution/soap is, they cannot accurately tell you the pH of your soap/soap paste only whether you have excess lye remaining in your paste which will affect the overall pH thus rendering a darker shade of pink. They are a good tool to use when making your paste along with a clarity test. 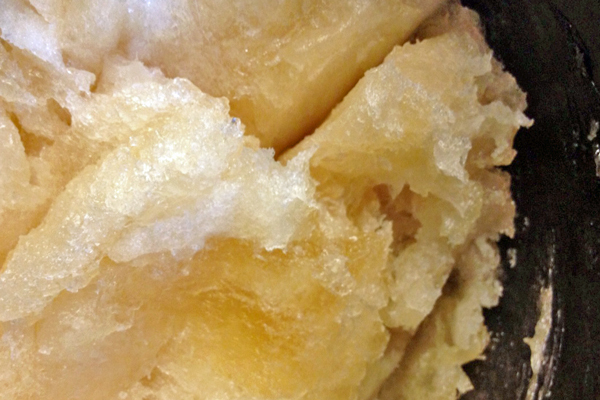 Clear soap can still have excess lye in it. The most accurate way to do this is via titration. Some people prefer the zap test (touching cooled soap paste to your tongue and if you get a zap like a 9V battery, you still have excess lye present), others do not. If you formulate with a lye excess, this step is not necessary as your excess lye will be neutralized after dilution. Step 12: Once the cooked soap paste tested with the Phenolphthalein drops is clear to very pale pink around the edges, I consider it done. Crock pot is turned off and I let let paste sit overnight. You could dilute immediately if you prefer Below is the finished soap paste. At this point it is usually a very, very soft consistency. Please note - if you formulate with a lye excess, you will not get a clear test with drops and will need to neutralize the excess lye after you dilute. Step 13: Diluting the paste - this will require quite a bit of patience if working with a new formulation. If you are recreating a previously tested formula, you should have all the notes for the proper dilution rate and can go off of that. If I am working with a new formulation, I typically start with a 1:1 ratio of soap paste to distilled water (unless the paste is very high in coconut oil, then you can start with less water). There is a sample dilution chart floating around the internet but your dilution will vary quite a bit it so it best to find a starting point and adjust from there adding water as necessary to fully dilute the soap paste. Take good notes here by recording your starting dilution ratio and any water additions. Measure out how much the paste you want dilute and place it in your crock pot turning it on high. 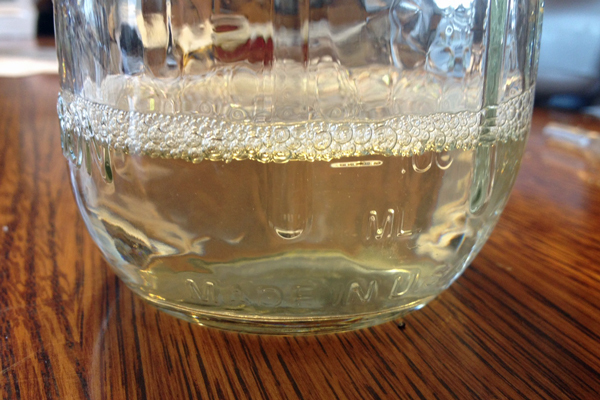 Keep the lid on while diluting or you will experience evaporation that will affect your dilution. For a new recipe, I usually start with 10 - 16 ounces of paste. Measure out the same amount of water plus one ounce and bring it to a boil (the extra ounce is to account for some evaporation when boiled.) 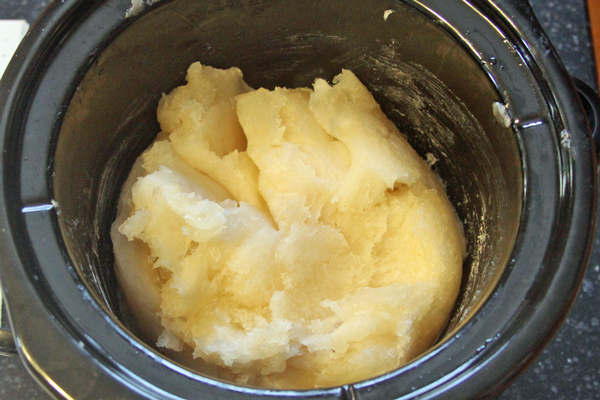 Measure out the required amount of boiling water again and slowly add it to the crock pot of warming soap paste. Break up the paste chunks as best you can with a utensil. Heat will help speed up your dilution but will also cause some evaporation - keep that in mind when using a heated setting on your crock pot. After another hour or so, I still have a soap skin on the surface - 2 more ounces of water (16:24) added, stir, put lid on and wait.......check again in another hour or so. 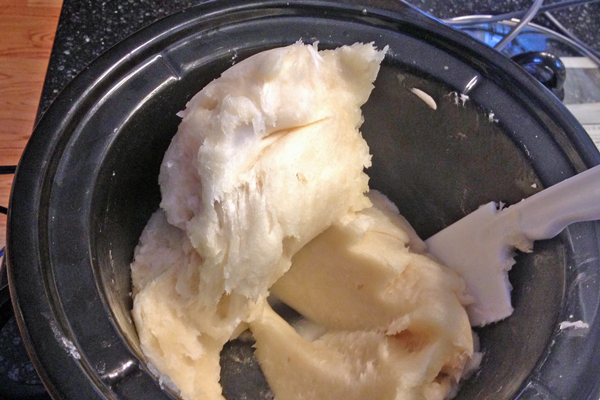 Another sign that your dilution needs more water is that the soap will stick to the sides of the crock pot. After going through this process several times, my current ratio is 16:30. I say that because right now my soap is still hot and the only way to know if the soap skin will not reform is for it to cool down. I take out a small portion (about 2 - 3 ounces) into a plastic container and let it cool down to room temperature (sometimes putting it in the refrigerator to speed up the cooling down.) If you see a soap skin forming, you need to add more water and test again. 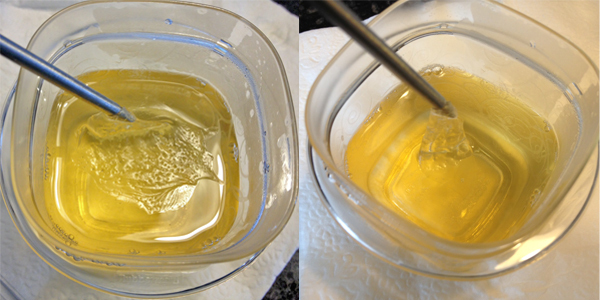 The images below show the formed soap skin on my sample. Back to the crock pot to add more tiny amounts of additional distilled water. Some people just remove the skin and dilute that separately. Keep your soap covered as you dilute and cool your sample to avoid the evaporation issue that will create the skin if fully diluted. Soap concentration is another thing you need to keep in mind when diluting your soap. The less added water, the more concentrated your soap will be and it may be too concentrated for your purposes - a little goes a very long way. Some people dilute so that the soap is of a thicker viscosity, but it will be very, very concentrated and you may end up wasting a lot of soap because even using a tiny amount may be more soap than you need - thus rendering it not as cost effective either. If you find that your preferred concentration of soap leaves it a bit on the thin side, you can always thicken it up with appropriate thickeners. This way you get a soap with the correct concentration plus the viscosity you prefer. I have several posts on various ways to thicken your liquid soap under "Liquid Soap Tutorials". Step 15: Now that the soap is fully diluted, you need to determine your finished soap weight as some of the added water will have evaporated out. Weigh the finished soap. This dilution ended up at a ratio of 16:30 ounces of paste to water meaning I should have a finished weight of 46 ounces of soap. My soap weighs 40 ounces so I lost 6 ounces of water during the dilution process. As a result, my actual dilution ratio is 16:24 or 1:1.5. For every ounce of soap paste, I need 1.5 ounces of water to fully dilute it. For future dilutions and for consistency purposes, this will be my starting point when diluting the rest of this batch or making another batch with the same formulation. While I might still need to add more water for a future dilution starting at this ratio due to evaporation, my goal is always to end up with the same amount of finished soap per pound of soap paste after dilution. For every 16 ounces of soap paste, I expect to have 40 ounces of finished soap each time. Step 16: Check the pH of the finished soap if you so desire. This is where your digital pH meter will come in handy. I take my room temperature sample and use the pH meter to test it. Right now, this soap tests at 9.3 in a concentrated solution which is just fine for liquid soap. Because it is in a more concentrated state than a lab would use to determine pH, the true pH is most likely a bit higher than the digital meter will read. I could take it down further by adding small amounts of a 20% citric acid solution (that is my neutralizer/pH adjuster of choice). You have to be careful in bringing down the pH using citric acid because it you take it to low (below 9 and even sometimes in the low 9's), your soap will start to cloud and then separate out back into fatty acids, water, glycerin and whatever soap content is left. The soap becomes unstable and can leave an oily residue due to the excess fatty acids. Pure soap, whether in liquid or bar form, is an alkaline product and will never have a neutral (7.0) to low or acidic pH value - otherwise it is not soap. I do not mess the with the soap pH unless it is over 9.7 in this concentration. Many of the current formulations out there allow for a slight superfat (1 - 3%) which will still create a clear soap and not need any neutralization at all. People have more problems with their soap due to the immediate use of citric acid or borax when the soap if first diluted. Soap gets cloudy or separates out due to unnecessary use of these additives. 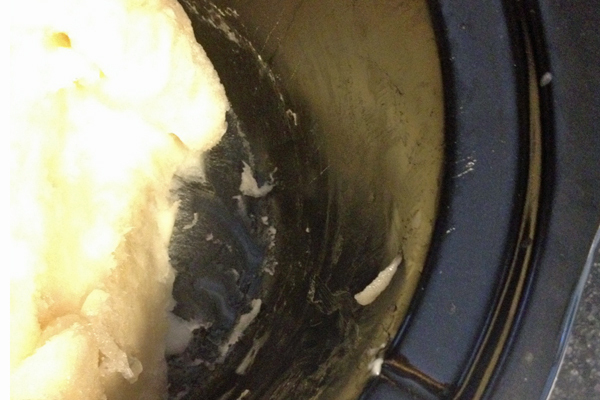 Step 17: Allow your soap to sequester for a few weeks. At this point your soap should be clear to slightly cloudy and sequestering it gives it a chance to mellow out some and increase the clarity. You can add clarifying agents (glycerin, alcohol, sugar solution) to help with clarity. Some people like to add glycerin in the amount of 1 - 1.5 ounces per pound of finished soap or as a certain percentage of the finished soap. Then let the soap sit for a few weeks. Once you get a good grasp of the process, there may be other ingredients you want to add during dilution. Since you really cannot superfat liquid soap as you can bar soap, you can superfat it after dilution using water soluble oils or esters. The ones I have found are sulfated castor oil, water soluble shea butter and water soluble olive oil (olive oil esters or olivem 300). Do not add standard oils to your diluted soap as oil and water do not mix. Step 18: Adding additional finishing ingredients including those above. Once your soap is fully diluted, time to determine which, if any, additives you would like to incorporate. These can be fragrance oils, essential oils, thickeners, etc. that you did not add before the sequestering. Thickening with Sodium Chloride (regular table salt): For 100% olive oil (Castile) soap you can use a 20% salt solution. 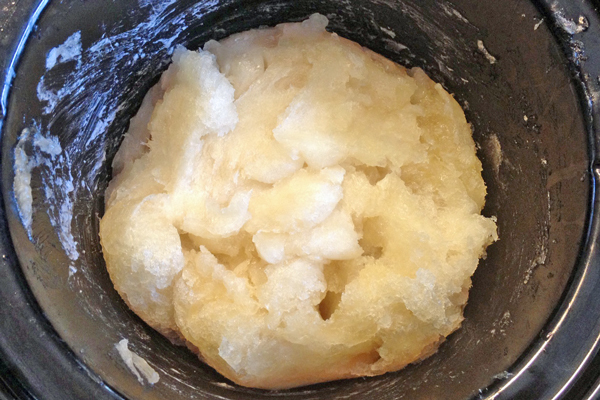 Soaps with any decent amount of coconut oil will not thicken with a salt solution. To thicken with a salt solution, boil 4 ounces of distilled water and add 1 ounce of regular table salt (not iodized). Mix and let the salt dissolve. Heat your soap up to 140 - 150 degrees F and add small amounts of the salt solution testing the thickness after each one and recording how much solution you are adding per pound of finished soap. While the soap may immediately thicken upon adding the solution, you will not know how thick it will end up until it comes back to room temperature. You can add the salt solution to room temperature liquid soap, but I have had undissolved salt particles end up in my soap that way. Take notes on how much solution you need to get the thickness you want. If your soap ends up too thick, you can always add additional water but then you are further diluting your soap. Better to go slow and take good notes. Thickening with Hydroxyethyl Cellulose (HEC) - This is the thickener that I have decided to go with for all other soaps, shampoos and body washes that are not 100% soft oils. Cellulose is a naturally occurring compound found in the cell walls of plants. HEC is water soluble and used at 1 - 3% depending on how thick you want your end product. I use it at 1% for shampoos and 1.2% for body washes. It is in powder form and is diluted in room temperature distilled water or glycerin. A good ratio for HEC to water/glycerin is 1:4. Add the liquid to the HEC and mix well until the HEC is dissolved into the liquid. If you let it sit too long, it will start to gel on you. If using distilled water, boil it first and let it come back to room temperature. 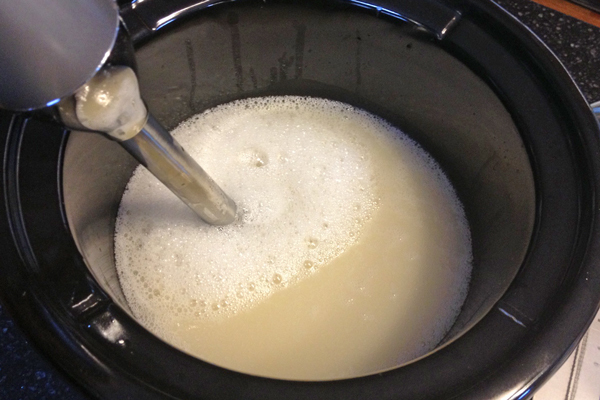 They key to using HEC to thicken diluted soap is that both the soap and the HEC solution must be at room temperature. If either one is heated, the HEC solution will gel up on you and be very difficult to incorporate into your soap (you will have to stick blend it in and will end up with a foamy mess that takes days to settle down). HEC can also be added during the dilution phase once you formulation and dilution rate is established so that you get consistent thickening every time. If adding it during dilution, boil your distilled dilution water and allow to come back down to room temperature then add your HEC/water or HEC/glycerin to your dilution water and mix well with a whisk. Continue mixing until the solution is fully dispersed into the dilution water then add to you paste. I use a crock pot to dilute and keep it on low or warm while the soap is diluting. It will thicken while it dilutes. If your soap ends up too thick, add an ounce or two if boiled distilled water to thin it out a bit - and again, take notes! Glycerin: 1 - 1.5 ounces per finished pound of soap. I have read that adding glycerin can bring extra emoliency to your finished soap. Not sure if this is true, but it cannot hurt your soap. I have also mentioned that added glycerin can act as a clarifying agent. Lastly, I have also read the glycerin can thicken soap but I have not noticed this to be true in any my soaps. Fragrance or Essential Oils: These are typically added at 1% - 3% (I personally think 1 - 1.5% is sufficient even less for some essential and fragrance oils - test, test, test.) Since these are oils are not water soluble, I like to add them to hot soap (around 120 - 140 degrees) so that they fully incorporate into the soap. There are also solubizers out there that will also help to better disperse fragrance or essential oils into your soap. I cannot stress enough to test any fragrance oil or essential oil on a small sample of finished soaps because they can affect the finished product. Some will thicken it, some thin it and some will make it cloudy. Some will even cause separation of your soap. When testing, add the oil to the sample of hot soap, mix then let it sit. It may look cloudy at first, but should clear up within a few minutes to a few days. If it does not, or your soap separates, you might want to try a different fragrance or essential oil. Again, take notes on what additives do what to your soap. You can also store your finished soap in a clean, sterile container, then add any of these ingredients at another time. Undiluted soap paste can be stored in a ziploc bag or other container to dilute at a later date. Step 19: Pour your finished soap into a good container with a secure lid to sit for a week or so. Liquid soap becomes milder over time. Take notes and do what works for you. I like to let my soap sit for a several weeks before I bottle it to make sure that no particles settle to the bottom. When ready, package into bottles, cap, label and use. Below is my finished soap from this process. A note on preservatives: Preserving liquid soap is a very hot topic with people on both sides of the fence. Some people never preserve their soap and others prefer to be on the safe side and do add preservatives. The thought process is that the pH of liquid soap is high enough to prevent bacterial or microbial growth. The higher the pH, the less chance of creating an environment for bacteria to grow. Mold, yeast and fungi will grow in higher pH environments though. The experts indicate that if your soaps pH is 10 or greater, no preservative should be necessary, under 10 you may want to add one. Then, the problem becomes the choice of preservative. Many preservatives available to use have pH restrictions of 8.0 and since our liquid soaps will have a higher pH than that, those preservatives may not be effective. Suttocide A is one preservative that is broad spectrum and effective up to a pH of 12. You must be careful with this preservative as it will react with any essential oil or fragrance oil that has citral as one of its components (most citrus ones) and will turn your soap pink to dark red. It is also heat sensitive and must be added to cooled down soap. Please read up on this preservative first. Another preservative to use is Liquid Germall Plus. A very reliable broad spectrum preservative. The manufacturer now indicates that is is effective up to a pH of 8, but I have seen confirmation from a microbiologist who is an expert in the field of cosmetic preservatives that it is effective up to a pH of 10 (this used to be the upper limit posted by the manufacturer). If you add any botanicals, proteins or extracts to your diluted soap, you may want to consider a preservative. Bramble Berry - Base Oils, Fragrance and Essential Oils, Potassium Hydroxide, Lye Calculator and a whole ton of great information on their blog. You can also start with one of their pre-made soap pastes to get a feel for dilution before jumping into the whole process. I'm fortunate I did simply because now Ive received a entire new view of this. Do you always need to use a thickening agent like glycerin or boric acid? I tested my paste in distilled water and it came out perfect. I;m just wondering where to go from here. There are bubbles in my dilution, but it's not thick like shampoo or body wash. I greatly appreciate your help. Hi Leah - I do not use boric acid at all. I use citric acid when I need to adjust the ph and HEC (hydroxyethyl cellulose) or table salt to thicken. I add glycerin to the finished soap not for thickening but for the added emoliency at about 1 - 1.5 ounces per diluted pound of soap. At that rate, I have never had glycerin thicken my soaps. Bubbles at the surface are normal as it is soap and they will settle out as the soap sits. Have you fully diluted your paste yet? No I haven't fully diluted it yet. It's still in my Crockpot. I'm getting ready to dilute it, but I'm a little nervous about making a mistake. I don't have a way to test the PH other than PH testing strips as this is my first round at making products using any kind of chemical like Potassium Hydroxide. Is the finished product really runny like water? Once it is fully diluted, it will most likely be thin - every recipe that I have created is on the thin side (not at all like a gel). What I would suggest is to not dilute it all at once. Remove your paste and store in a container and start with about 10 ounces to dilute. That way you can easily determine your dilution ratio without using up all your paste. Your recipe will determine how much boiling distilled water will be needed to fully dilute it. I usually start at 1:1 so 10 ounces soap paste and 1o ounces boiled distilled water, then add more water and take notes as to how much water it took to fully dilute your 10 ounces of paste. That way when you go to dilute the rest of it or make another batch, you know how much water you will need. As for the PH, the test strips won't do you much good. They will give you a range - just make sure you are comfortable that it is below 10. A digital Ph meter that can easily be calibrated is definitely the way to go. Thank you so much for all your help! I have a book that teaches you all about making liquid soap but it's very confusing. I found your blog and it was extremely helpful! I want to ask you something. Using this method I can make shampoos. All I need is to used oils that I want and the final result is a shampoo or I need to add something different towords liquid soap? Hi Daniela - it really depends on what you want in a shampoo. A basic cleansing shampoo would just be using the oils you choose and creating the liquid soap. There are lots of additives you can then add to your shampoo that make them more than just a liquid soap you use as shampoo. Some great additives for shampoo are panthenol, proteins (silk, wheat, oat, soy) and conditioning agents like polyquats - all make great additives for shampoo. The process for liquid soap and shampoo is the same - it is your ingredients that will make it one or the other based on your preferences and how you want to use it. Do you pick the powdered form over the liquid for a reason? I noticed that it comes as a liquid also--and that might change how much to add. I scanned but didn't see a percentage either but I'll check again! Thanks. Hi, I love your blog and recipes. I want to make liquid soap and looking recipes. You explained very detailed, awesome :) I want to ask, when I calculate your recipe online lye calculator, your lye is very high, for %0 fat 3,29 ounces KOH. Do I miss something? Hi there and thanks for the comments. When you use an online calculator, make sure that you select liquid soap and not bar soap. You need a bit more KOH (Potassium Hydroxide) to saponify oils for liquid soap than NaOH (Sodium Hydroxide) for creating bard soap. If you run the numbers through both SummerBee Meadow and Brambleberry's calculators at a 0% superfat, you will get those same numbers for KOH and liquid. Yesterday I made a batch of LS and it is jelly when is hot but when is cold it looks like a solid soap. I need to coock it more or is because of KOH? My lye is 91.1% but in soapcalc I choose only KOH. Now I recalculate the formula and when I choose KOH 90% the quantity of lye is a little bit more. Hi Daniela - it is quite normal or your soap paste to be a different consistency when hot than when room temperature. I do not use soapcalc to calculate my lye amounts so I am not familiar with that calculator and the results it is returning to you. Have you tested for excess lye using Phenolphthalein drops? How long have you cooked it already? hi. thank you for the info on hec. making clear baby shampoo for my coschem project. At first I added my surfactant blend and water phase to warm hec and it looked like a slurry :( I read your post...I then added my ingredients to room temperature hec gel and it seem to work better. There is no oil phase so it should be stable... I am using Lotioncrafter hec. It doesnt clump cos its R grade..
Hi Sarika - I am not familiar with surfactant blends for liquid soaps as I do not use them and therefore am not familiar with the process of incorporating HEC as a thickening agent into this type of soap product. I am only familiar with thickening soap that is created from the saponification of oils from scratch. With interest I have read the information in this tutorial and your comment that lowering the ph value of KOH soap below 8 does not make sense because you wont have soap anymore. The natural ph of the skin is about 5.5. I have read a survey on commercial shampoos in which most manufacturers claim 'ph neutral qualities'. Most shampoos are reported with a ph between about 4.5 and 6.5. Could you tell me how they achieve that low ph without loosing the soap effect of the shampoo? Hi Mahant - Those "ph balanced" cleansing products are not true "soap" which is created from the saponiification of oils and an alkali (sodium hydroxide or potassium hydroxide). Anything that is ph balanced is a detergent based cleanser. Keep in mind that PH is not an indicator of how gentle or effective a cleanser is. You can have a "ph balanced" cleanser that is very harsh on the skin and hair stripping away the natural oils your skin and hair need and you can have a higher Ph "Soap" that is very gentle in that it does not strip away the natural oils. Because commercial products are not alkaline (ph > 7), they need chemical detergents to be an effective cleanser. This is also why you will never see the word "Soap" on a detergent based product. You will see terms like "cleanser", "beauty bar", moisturizing bar" but NOT "soap" as by law they cannot be labeled as such. So - no, you will never have a "true soap" product with a ph of 5.5 or 7. HI "Going Messy" - Olive Oil Soaps can take a very long time to trace and cook so that does not surprise me. 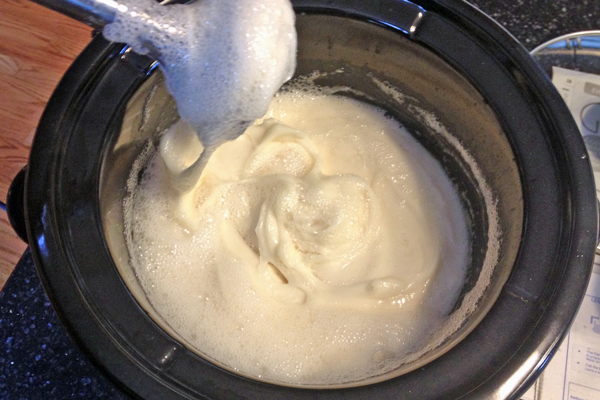 Yes, you can use other liquids to create your soap paste. Many people use flat beer or teas. I tried coconut water but was not happy with the results as I don't think the nutrients carried over into the soap. I use goat's milk and coconut milk in two of mine, but you have to account for the extra fats in milk products when calculating your KOH. You do not want to use these in place of or as part of your dilution water as they will cause your soap to go bad. In order to speed up the time it takes for your soap to trace, you can use the glycerin method or the 50/50 method (or a variation of this ratio) for your next batch. I have tutorials for both of those too and they really help with high olive oil content soaps. Hello Faith. I do appreciate your prompt reply. i was thinking of reserving all the good properites in the milk so using it in the diluting phase. maybe using some kind of preservative to stop it getting bad. what do you think? what if i want to add honey in the final stage. what preservative would you recommend? The problem with using coconut milk as your dilution liquid is the fat - and there is a lot of it in coconut milk. It is not water soluble and the fat will just rise to the top of your soap creating a nice thick layer. Dilution liquid has to be water soluble. Just because something is liquid, does not mean it is water soluble. In regards to preservatives, this is a bit controversial when it comes to liquid soap. Some people say the ph is high enough to inhibit nasties from growing, others will say that some nasties will grow in any environment. BUT, there are very few preservatives that will be effective in these types of liquid soaps. Most of the ones used or recommended for use have an effective ph range < 8 and that includes optiphen and liquid germall - so people who are using those preservatives really are not doing much preserving as the ph of liquid soap will be 9 - 10 on average - which is too high for those preservatives to be effective. The only preservative that will work in a high ph environment is suttocide A which is not as readily available as the others (I have found 2 sources only). So, if you are going to use a preservative, make sure you research the ones you are considering to make sure they are compatible with your product. Thanks alot Faith. Very detailed and informative. Wish you the best! Hi Faith! Thanks for such a great post! I just finished my first batch of liquid soap and I think something went wrong. I needed to neutralize my paste so I used a citric acid solution. Immediately upon adding it to my paste, everything turned a milky white. I continued to heat it and as I did, it seemed to clear up. I let it sit overnight after the first dilution and it looked cloudy with a thin, chunky film along the top. I added more boiling distilled water to continue to dilute it down, heated it all up, and it seemed to clear up again. But when I looked at it again after sitting overnight, it's cloudy again. The PH is great, the soap lathers wonderfully, but it's thin (not syrupy) and cloudy. I should mention it's high is olive oil with coconut oil and jojoba. Any idea what could be happening? Hi Trisha - did you add the citric acid solution to the paste or the finished soap and how did you determine you needed to neutralize it? You say the pH is great - what is your pH? Jojoba oil (actually a liquid wax) can cause cloudiness if too much is used. If this is a fresh batch of soap, slight cloudiness is ok and it may clear up as it sequesters. Hi Cabrini - Shampoos made using KOH will always have a pH in the range of 8.5 - 10, that is the nature of liquid soap/shampoo as it is an alkaline product and there is no way around that. Everyone's hair is different and will respond differently to any type of hair care product. Water used can also play a role (hard water can be notorious for making rinsing KOH or NaOH based soaps/shampoos more difficult due to the metals in that type of water). If your shampoo is working for you without issue, then is sounds like you found a formulation that works for you. Hi Faith. I was wondering is it necessary to let the paste sit over night or can it be diluted immediately. Thanks, your site has helped me a lot . Hi Jackie - As long as you feel it has been thoroughly cooked throughout the entire batch of paste, you can dilute it. I usually leave it to sit overnight to insure that all parts of the paste have been throughly cooked. 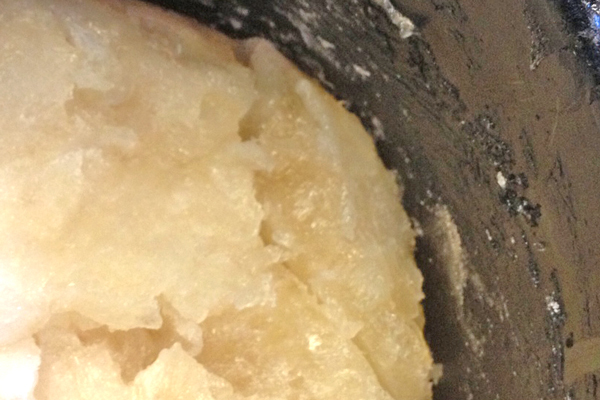 Some pastes can get so thick and stiff it is hard to mix it as it is cooking. Hi Faith, I am glad I found this page..I am working on different shampoo recipes that don't contain KOH because I have been told KOH method is too harsh and/or pH balance issues. I have read above your responses and I like your posts. Now I want to make a shampoo using the LS with KOH and I want to make a shampoo that uses Xanthan gum as a natural thickener, can you give me an idea of when I would use it and perhaps a % (I'm thinking at the thickening stage of course)! Gratitude for any ideas or response. HI cindiQ - glad you are going to give liquid soap a try. True soap whether made with KOH or NaOH will always have a pH in the range of 8.5 - 10 or so (some put the upper limit higher and the lower limit slightly lower) - but it will never have a neutral to acid pH - otherwise it is not soap. Cleansing products described as pH balanced are not true soap products but syndets (synthetic detergents) whether in bar or liquid form. Each has its benefits and drawbacks and each person will have a preference over what they prefer to use or create. I have never used xanthum gum as a thickener but I do know of people who have used it successfully. A lot of success depends on how you incorporate these thickeners into your diluted soap. If you are on facebook, there are two liquid soap groups there (liquidsoapers and liquid soapmaking) where members share a lot of information on their trial and errors when it comes to this type of soapmaking. They are very, very helpful groups. At what stage do I add the Panthenol for shampoo? You would add any water soluble additives after or during dilution. Panthenol comes in a liquid form (usually a 50% - 75% activity level) or a powdered form. The powdered form needs to be dissolved in distilled water first. I have just started my first batch of liquid soap using mostly coconut oil and a little bit of castor oil, at 0% super fat. It has been cooking for about 6 hours and has a pH of 12. Is the pH likely to reduce as it continues cooking or will I need to neutralise at the end? Hi Linda - A pH of 12 is too high for liquid soap and is usually the result of an excess of KOH, not long enough cooking time or not enough heat during the cooking that you have completed. Make sure that you are using an accurate method of testing your pH too. Liquid soap will naturally have a pH in the 9 - 10 range as it is an alkaline product (that is what makes it soap). It is more important to determine whether you have a lye excess - test for that using the phenolphthalein drops if you can. If your clarity test shows a clear sample, but you still have excess lye, then yes, you will need to neutralize that excess lye from your soap. Thanks for this tutorial. I've made several batches of liquid soap and tried to make shampoo. The shampoo cleans well, but after about 3 uses, there's a lot of buildup on my hair. I suspect that is the superfatting (and may be pH related). I plan to try another recipe with zero superfatting to see if that makes a "cleaner" rinsing shampoo. I don't mind that the soap is thin and I don't add anything other than fragrance, but I'm having a hard time finding a formula that doesn't build up quickly! If you have any thoughts on percentages of coconut oil versus other oils, please share! I am thinking of coconut oil, castor oil, and possibly peanut oil (the liquid oils make a clearer soap and peanut is cheaper than olive oil). If I add shea, I know it may cloud some, so I'll keep that amount small. I know some oils leave more unsaponifies too and I'm worried that is contributing to the buildup. Again, if you have any deep thoughts on the matter, please let me know. I've read that too high a coconut content (above about 35 percent) may be a drying formula. I was hoping to try a liquid soap at 50 percent coconut and other oils, but am worried it might dry my hair out. Thanks again for the great tutorial and for answering questions in the comment trail. Your dedication and time is appreciated! Hi Maria - glad you like the tutorial. These types of shampoos can be difficult to formulate as hair and water conditions can vary so much for individuals. If you have hard water, soaps made with KOH or NaOH can be difficult to rinse and cause build up on anything. If this is your case, you may want to try a vinegar, apple cider vinegar or citric acid rinse to help remove any build/rinse better and also to help neutralize the pH of the hair if you do not follow up with a conditioner for that. Not everyone can use a KOH or NaOH based shampoo due to the higher pH of the naturally alkaline product or due to hard water conditions. Keep in mind it can also take an adjustment period for one's hair to adjust to a new regimen. Another think you can try is to add sodium citrate (dissolved in distilled water) at 1 - 5% to act as a chelating agent for hard water. In theory that should help too. I was afraid it might be the hard water. We have a lot of lime in the water here and it builds up on everything. The problem is that I"m not even having much luck with commercial shampoos. They either build up in two or three days or dry my hair to straw. The vinegar helps to some extent, but it tends to leave my hair either fly-away or frizzy or both. The vinegar isn't my favorite smell either.. This is why I have wondered whether it's the pH or the oils or a combination of both. Well, all I can do is try a batch and see what it does. If I use less superfatting, in theory, the build-up should take longer to occur. In theory... Thanks again for a great blog. One more question: Have you ever tried Guar Conditioner in place of the HEC? It appears to be similar (thickens and used in hair products). If you have any experience with it, please let me know! I can order one or the other or both--their use seem similar as does the method for adding it! I have tried the cationic guar (called guarsilk from the Herbarie) INCI: Guar Hydroxypropyltrimonium Chloride. I did not have success with this one in liquid soap but have heard of others who have. It is best in products with a pH of 7 or below but may be effective up to a final product pH of 9. This is where it gets tricky. Liquid soap typically has a pH between 9 and 10 which may prevent the ingredient from doing its job effectively. It is an excellent ingredient in surfactant based cleansers/shampoos though and I do use it successfully in those applications. Thanks. I think they both (Guar and HEC take quite a bit of stirring? The spec sheet for Guar said 30 to 60 minutes! I think I may try the HEC. I've just about finished diluting a batch and it's between 8 and 9 pH, but I'm using test strips, not the pro equipment. If the HEC is easier, I'm more likely to stick with that and both spec sheets say it is fine for hair products. I'll try the soap without the thickener first though because if it's too "sticky" there's no point in buying pantene and thickeners! I run a blog that is mostly for readers/writers. Would you like to do a guest post there on soap or shampoos, etc with a link back to your store? The key to using thickeners is understanding how they work. Both HEC and cationic guar require hydration and stirring or agitating the solution helps it to hydrate and distribute evenly. When I use the cationic guar in surfactant systems, it hydrates in the distilled water of my formula with occasional stirring for 15 minutes to an hour while I prepare the other ingredients for the formulation. HEC hydrates with heat and increased pH which is why you do not add it to warm or hot liquid - it will hydrate and gel on you immediately and will be very difficult to distribute into your finished product. Thank you! I think I'll try both the pantene and the HEC. The soap I finished yesterday did okay on my hair, although I suspect I'll need a clarifying soap at least once a week. I'd also like to add something for shine at the end so I'll need to do some more investigation. Apparently none of the ingredients I used imparted much by way of shine (although obviously most of the oils are "used up" by the lye.) For the next batch I may go even higher on the coconut oil. It was 50 percent this time. We'll see if it dries my hair over time. Can you post the link to your tutorial on HEC and mixing it? I found it, but didn't bookmark it and now I can't find it! I thought one of the above links went to it, but not so! Thanks again for the tutorials. Incredibly helpful. You should put them all into a book and sell it on Amazon! Hi! I would like to ask if there's a difference if I use distilled and not distilled water? Also should water be heated up? And if I do not use a stick blender, how long would it take for me to obtain the desired consistency? It is always best to use distilled or some type of purified water. Tap water has iron, minerals and metals in it that can cause problems in soapmaking - especially for dilution. Never use anything but distilled water to dilute - no milks, no coffee, no tea, no beer, etc. Food products will go bad and ruin your soap. Those should be used up front when making your paste. You do not heat the water for dissolving your lye - the lye will heat it up quite a bit. For dilution, you want to boil your water or heat and hold at 70 Degrees C (160 F) for 20 minutes to kill anything that may be present in it. You can also heat and hold your finished soap at these temperatures too. You want as sanitary an environment and ingredient usage for Good Manufacturing Practices. Hi! 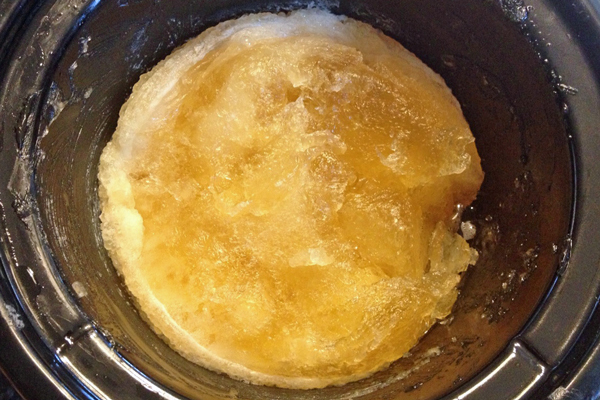 I want to avoid heating any ingredients and try to make liquid soap only using cold process. Instead heat up on the oven what should I do with the soap? 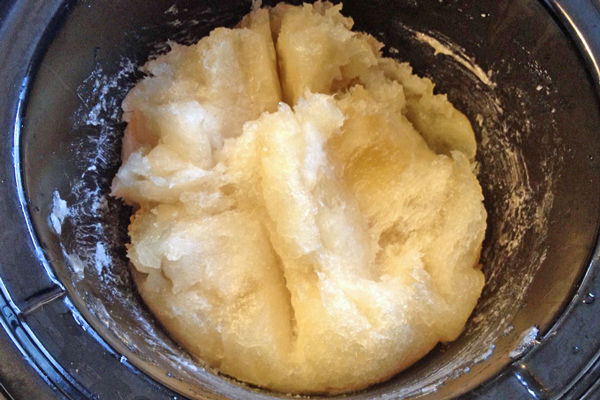 You cannot avoid heat completely when making liquid soap. First, adding your KOH to your distilled water will generate an enormous amount of heat plus you need heat to melt your solid oils and butters. However, once your soap comes together into a homogenous state and no longer separates, you can wrap your container in towels and set aside for several days (this can very from 1 day to up to 2 weeks) and allow the saponification to complete via "cold process". and I should apply dilution after this period of time, lets say two weeks? Two weeks is just one estimate - really depends on how long it takes for the saponification of all your oils to be complete. You go through the same tests to check for excess lye and clarity as you would if you hot process your paste. Once your paste is complete (no matter what your method), then you are ready to dilute it. Thank you, so much, for the invaluable info you posted on your blog. It answered many of my question about liquid soap. My trouble usually starts with neutralization and I wasn't able to understand what was going wrong until I read your blog. Armed with new knowledge I decided to make a small batch of coconut liquid soap and follow your instructions. Everything was fine and my soap looks perfect. But there is a discrepancy between my pH and what you say it happens with your soaps. My 1% solution, done after 8h of cooking, showed 9.3 and the finished diluted soap is 9.7 pH. That is completely opposite of what you usually have. The phenolphtalein test of diluted soap and soap paste was completely clear, no sign of pink at all but I can't stop wandering about the pH results. I hope you will be able to tell me the reasons for that as my diluted soap is right on the border of neutralization which I want to avoid. Hi Melissa - so glad you were successful in your attempt to make liquid soap. As far as pH goes, have you read the post on testing pH and what causes inaccurate reading? Yes, I did. I even bought a new pH meter to be absolutely sure. I hope this post won't get duplicated. If it does, I apologise. Actual pH will vary from batch to batch and reading to reading for various reasons. pH meters have a +/- accuracy of a few tenths of a point too so two different meters could get slightly different readins on the exact same sample (I have three meters and they are never identical). It is really not pH you need to worry about as true liquid soap will always have an alkaline pH - but excess lye. Yes, I realized myself that pH meters are somewhat strange and have to be calibrated very often to get the most accurate results. Anyway, I made another batch of coconut oil just to see how will it go and I was very pleased with the outcome. Everything was fine this time, no discrepancy with the pH levels. My 99% solution was 10.0 and the diluted soap is at 9.5 pH. Now I know I'm on the right path and I have you to thank for that. The way you test the soap paste for the excess lye is the most helpful thing for me. Thanks again for this incredible blog. I hope to see some of the post in the Recipe section soon. Yes - cold process shampoo bars and liquid soap shampoo do not work for everybody. These products will have a higher pH than other surfactant shampoo systems due to the alkaline nature of soap. That higher alkalinity raises the hair cuticle/shaft and can cause tangling of all those tiny raised hairs (mild to severe). This is why an acid rinse or other type of conditioner is often necessary - to lower the pH and close the cuticle. Those were permanent hair color (not temporary or semi-permanent) in which the color is deposited in the hair shaft during the coloring process should not use high alkaline hair products as when the cuticle is lifted, that hair color can leach out. Other coloring systems deposit the color on top of the hair to coat it so the alkalinity is not an issue for their color as with permanent color. A greasy feeling could also have to do with the superfat of the product. Even though these are wash off (out) products, a high superfat will leave some of those excess oils behind which could be too much for some hair types. Shampoo bars are easier to superfat than liquid shampoo too. It would be difficult to offer suggestions on how to fix something like this as each person is different. But, just remember, alkaline products do not work well for everyone. I want to ask, I have a combination of coconut oil: olive oil: sunfloweroil = 75: 15: 15 but at this stage of the test the clarity of me not to such a degree that every time I try the hot water would have formed white emulsion like milk, but which I suspect is hot uneven. How about this? If when doing a clarity test (a test to determine whether you paste is done cooking) and you end up with a milky solution - that typically means you have not cooked your paste long enough and should continue to cook it until it is no longer milky looking. However, this may depend also on the oils/butters you choose to use. Those high in unsaponifiables or stearic or palmatic acids may never be clear. I have a question. 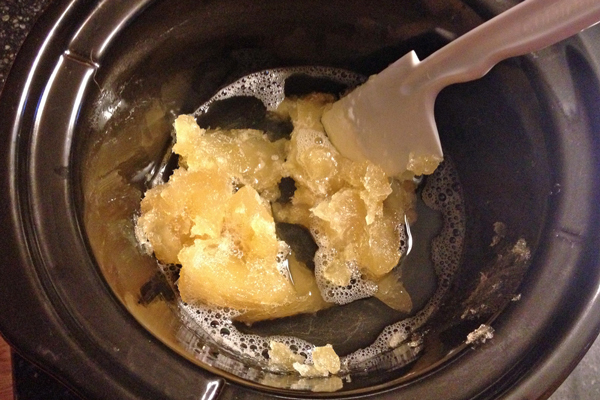 When you dilute your soap paste, do you leave the crockpot on? I still have a soap scum on the top of my soap that I made last night but it was off all night, wondering if I left it warmer it would dilute quicker? I leave the crockpot on low - heat will help it along but can also cause some evaporation. Liquid soap/shampoo made with potassium hydroxide is not suitable for all hair types. High alkaline products will lift the cuticle/hair shaft and cause all those little pieces to get very tangled and may cause damage/breakage especially with continued use. Many people will then use a conditioning product to then close the hair shaft/cuticle BUT it will not correct any breakage and damage that was previously done. Shorter hair styles seem to be less affected by this as the damaged ends are cut off more frequently. Some people have no problems using a high alkaline product on their hair - each person will be different. Hi and thank you for the photos and step by step instructions! I am troubleshooting a batch that was turning translucent (with the crockpot on high) but after the first 1hr of cooking the paste turned white and semi-foamy, it developed microbubbles and now has the consistency of mashed potatoes. I had no liquid separation after the initial stir, so do you have any advice for why I no longer have translucency? I would greatly appreciate any clues you've got! 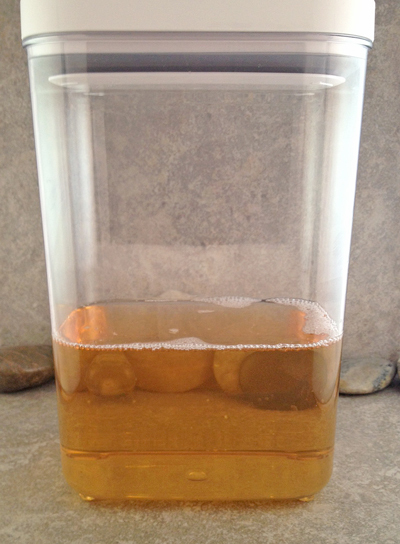 HI Ashley - have you done a clarity test yet with distilled water? Pastes will vary from formula to formula and even batch to batch and you cannot rely just on how it looks to determine if it is ready to dilute. Thank you so much for the reply! Per your suggestion, I checked clarity and it is still cloudy, and I checked the pH with phenolthaleine and it is not pink, so is it possible I don't have enough hydroxide if the soap isn't clear? Are you aware of problems due to cooking soap at too high of a temperature initially in a crock pot or do you know what would cause it to foam? My paste is pretty much the opposite of a thick gel, it's 48% coconut and 52% olive, without any other additives. Again, many, many thanks for your reply. If your Phenolphthalein test is clear that means that there is no excess lye. If you still have unsaponified fats in your paste there will be nothing for them to react with to turn those fats to soap which could be the cause of the cloudiness. If that is the case, you may have mis-measured or over estimated the purity of your KOH. Things to check - make sure that you checked KOH in the calculator that you used and the 90% box if you used soapcalc. Make sure that you did not accidentally use NaOH instead of KOH when creating your paste. This may sound silly - but people have accidentally calculated for KOH but used NaOH instead. This will not stay translucent as NaOH is for opaque bar soap. As for foaming - this will happen if you use the glycerin method and you mix it too much while creating the paste. You can end up with a thick layer of foam on the surface and a dark fluid amber liquid on the bottom. Thank you so much for the help. When you are testing with Phenolphthalein on the paper towel, do you wait for the sample to dry to check the pinkness (this may sound really obvious to you)? It takes a while for the pink color to develop on the paper towel so I'm just wondering if you make your clear sample determination once the paper is fully dried after placing the drop on it. Again, thanks for the guidance, your blog is so helpful! Focus more on the actual paste as the pink that shows up in the paper towel after a bit can be a false representation of excess lye and more an indicator of an alkaline pH. Using drops directly on the paste is a quick test but can have minute accuracy issues. Try testing on something nonabsorbent but white or clear. The most accurate way to test with drops is by titration. I have used the beginner recipe mentioned on this post.I have reached mashed potato consistency and starting cooking in crock pot for 4 hours now.It is still in that form and no change.I didn't see any transparent soap yet.Any idea what would be the problem? Thanks very much for your wonderful tutorials. Hi Sravanthi - My first suggestion is to make sure that you are using enough heat to move the saponification process along. Saponification of your oils/lye mixture goes faster with the addition of heat and/or glycerin. Have you done a clarity test yet? Not all pastes will look the same and not all paste will have that translucent look. Start with a clarity test to see where you are. Thank you. Make sure to check out the other liquid soap tutorials too. Hi. You state, "Thickening with Hydroxyethyl Cellulose (HEC) - This is the thickener that I have decided to go with for all other soaps, shampoos and body washes that are not 100% soft oils." Could you elaborate on why you would not use HEC on 100% soft oils? New to liquid soap and just finished my first batch based on your tutorial. Working on dilution now. Thank you for sharing such clear instructions. Hi there... I made a number of batches of liquid soap that turned out perfectly every time. Then I decided to try a double batch. Everything went the same (I used borax in each batch), until I added patchouli and orange essential oils. It went instantly cloudy. I have sequestered for several weeks and it appears to be settling with the proper clear amber on the bottom and the majority still cloudy and fairly thick. Is there a good natural clarifier for this condition? Can I reheat the cloudy bunch and see if it comes to trace again? The texture is good and it works as soap. I am wondering if it is the two essential oils I used that is the cause. I know real patchouli is not as reliable as synthetic patchouli. But I want to use the real thing!